This post is a little different to the recipes I usually post. But it still covers the topic most close to my heart – cooking! No surprises there…this is a food blog after all. But more specifically its about learning how to be a better cook. I’m not professionally trained in any way shape or form. I’ve learnt all I know from Home Economics classes, my Dad and the internet. It’s as simple as that. But there is one thing which I wish I’d focused on when I first started getting into cooking because it is the key to becoming a better cook – the French Mother Sauces. For those of you who don’t know, there are five mother sauces in total which form the foundation for both home cooking and restaurant cooking. While some of them aren’t used as much any more – or only appear in high end restaurants, understanding the five categories and how to make the basic sauces will mean that nothing will phase you in your own kitchen. Also known as white sauce, you’ll probably recognise the term béchamel from some of your favourite comfort foods – lasagne, macaroni cheese and even chicken pie all use béchamel sauce. If this isn’t one you’ve already mastered then it’s a great place to start. It’s made by creating a roux from milk, butter and flour and can be flavoured to turn it in to a finishing sauce, otherwise it’s a little bland by itself. Want to perfect your béchamel? This Classic Lasagne by Its Not Easy Being Greedy uses a class béchamel sauce. The next mother sauce you may have heard of is the velouté. This often appears on restaurant menus but is not all that difficult to recreate at home. It is usually served with either fish or poultry that has been delicately cooked. Nazima from the Franglais Kitchen has a great recipe for Pumpkin Velouté Soup which incorporates this traditional French Mother Sauce. Sauce espagnole is probably the least well known of the five mother sauces. Espagnole is a basic brown sauce made from beef or veal stock, tomato puree, and browned mirepoix which is then thickened with a very dark brown roux. Taking one step back, mirepoix is a mixture of sautéed chopped vegetables (traditionally onions, carrots, and celery). If you’ve ever made a boeuf bourguinon you may have already come across this technique! If not, Roz from the Foodie Couple Blog has a great recipe for boeuf bourguinon which can introduce you to this essential mother sauce. There’s a clue in the title with this one… Sauce Tomat, the fourth of the French Mother sauces, is made from you guessed it TOMATOES. The sauce is made by cooking tomatoes down into a thick sauce. Low and slow is the key here which makes it an easy one to prepare in a slow cooker. Traditionally this was then thickened with roux and the classic French tomato sauce would be flavored with pork and aromatic vegetables. Nazima from the Franglais Kitchen has a cracking recipe for a Sauce Tomat made with slow roasted tomatoes and pepper which you can find here. Last but not lease we have hollandaise. You’ve probably eaten hollandaise with eggs Benedict, fish or perhaps as a dipping sauce for asparagus? It’s one of the better known Mother Sauces and – another interesting fact for you here – is the only one not thickened by a roux.Hollandaise is instead thickened by an emulsion of egg yolk and butter. This requires some degree of science as egg and melted butter wouldn’t usually blend together. It’s a bit of a tricky sauce to get right but once you’ve mastered it breakfast will never be the same again! Put down that hollandaise packet mix and find out how to make Plaice Florentine with Hollandaise with the help of Ceri at Natural Kitchen Adventures. So there you have it – the five mother sauces which form the basis of French cuisine aren’t all that difficult are they? Follow my advice above and I guarantee you will instantly up your cooking game! My pleasure Diana I’m glad you enjoyed the post and hope it’s useful! I also use bechamel alot – it’s definitely my favourite but would like to use the veloute more! What a helpful post! I love Hollandaise, and it really isn’t as tricky to make as people think. Delicious over steamed leeks. Yum! I definitely need to learn how to make good bechamel sauce 😉 Wasn’t good at it last time! Great round up. My pleasure Roz. Glad you like it! 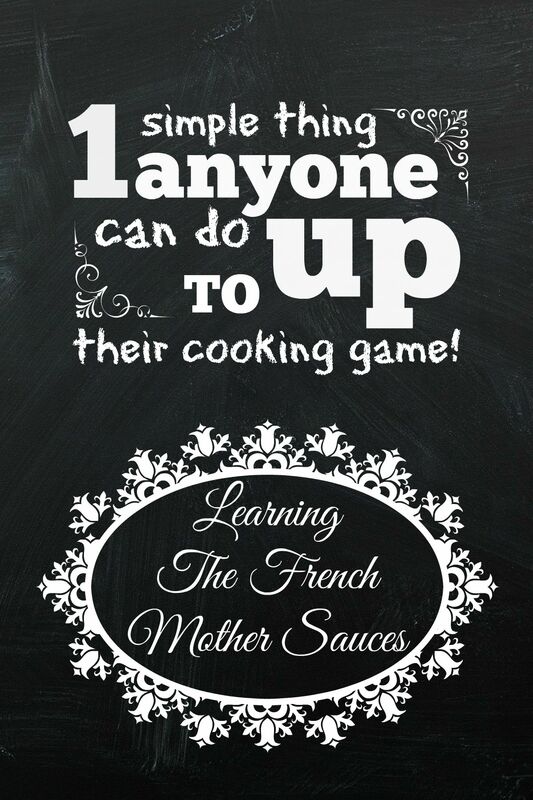 I never knew they were called French Mother sauces – you definitely learn something new every day! Thanks for the lesson, and for linking to my lasagne. I look forward to learning more and exploring the other recipes shared. Thanks Tracy! I’m glad you enjoyed it. You do learn something every day don’t you 😀 I know I do – especially in the blogging world. A great article to remind us all about the pillars of French cooking – sauces! Can’t go wrong if you follow the French. They know their stuff! Thanks for featuring my Hollandaise! Have you seen a film called the Hundred Foot Journey, the 5 mother sauces are the thread linking the plot. Strangely enough before watching it this year, I had never heard of mother sauces though obviously I knew them individually 🙂 It’s a nice post, I am going to write one about béchamel soon, I’ll link to yours if I may.